Set in an isolated region in Northeast Turkey, Bal arrives at Yusuf's childhood when six year old Yusuf has just started primary school and is learning how to read and write. His father Yakup works as a honey-gatherer, a risky trade which involves climbing up ropes into the tops of trees where the hives are. To Yusuf, who accompanies his father to work, the forest becomes a place of mystery and adventure, and he watches his father in admiration as he works sometimes higher than the eye can see. Yusuf and his father have a very strong bond and although he is tongue-tied to the point of stuttering paralysis in social situations, he can read and speak quite clearly when he's addressing his father. Ridiculed by his classmates for his stammer, Yusuf's anxieties escalate when his father must travel to a faraway forest to hang his hives in a treacherous mountainous area. Days pass and Yusuf and his mother become anxious when Yakup doesn't return. Distraught, Yusuf slips into silence but finally summons all his courage and alone, runs deep into the forest to search for his father. A journey into the unknown. 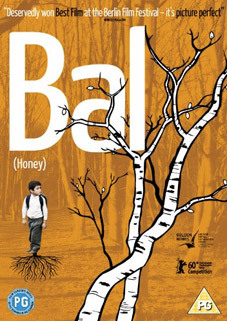 Turkish director Semih Kaplanoglu's multi-layered and visually stunning film and winner of the Golden Bear at the 2010 Berlin Film Festival, Bal (Honey) is a beautiful meditation on familial love and the mysteries of nature. Bal will be released on UK DVD for the first time ever on 3rd October 2011 by Verve Pictures at the RRP of £10.89. The only included special feature will be a trailer.